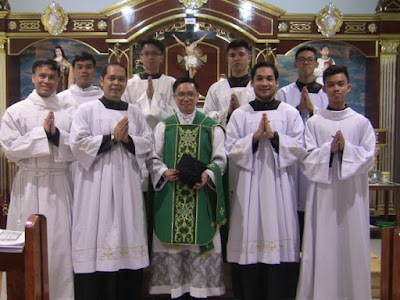 Fr Kyle Tabotabo, of the Archdiocesan Shrine of St Pedro Calungsod in Cebu City, Philippines, ordained in 2015, celebrated his first Mass in the usus antiquior this past Sunday (13th after Pentecost), a Missa cantata at the Adoration Chapel of Our Lady of the Sacred Heart Parish in Cebu City. He was assisted by the members of the Cebuano Summorum Pontificum Society, who are responsible for organizing the weekly EF Masses in Cebu, and the Schola Gregoriana of Cebu. No “nostalgia” here, my friends!